The wreckage of the Grenfell Tower in London following the devastating fire in June [Image: Alicia Canter for the Guardian]. How many nails do we have to hammer into the minority Tory government’s coffin before we can bury it for good? It’s no surprise that the Equality and Human Rights Commission has launched an independent inquiry into the Grenfell Tower fire. We know the official government inquiry is ignoring serious issues including whether the building had adequate safety measures before the fire took place. We know that government – both local and national – reacted poorly to the fire, trying to hush up information about how it happened – and what happened to the money that was given to help the survivors? 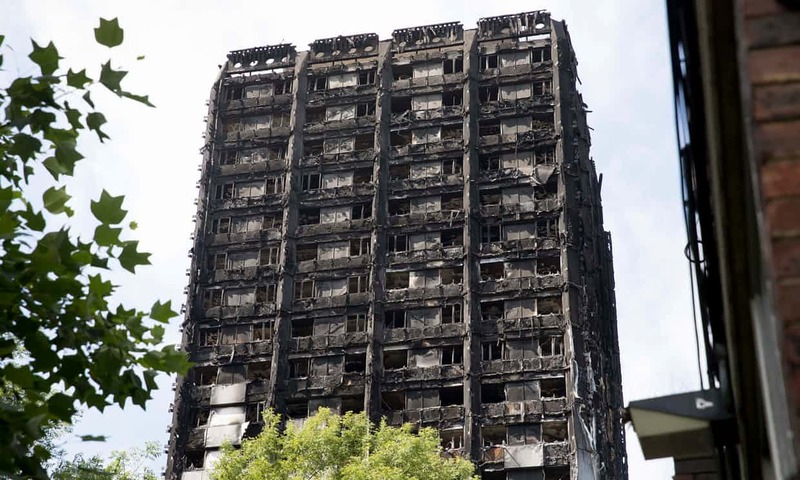 And we know that those survivors are still living in temporary accommodation despite the fact that Theresa May said they would all be housed within three weeks of the blaze – which happened in June. Yes – let’s have an independent inquiry into what happened and who is responsible. It will be very interesting to see if it lays blame at a different doorstep from the official investigation. Britain’s human rights watchdog is to launch an inquiry into the Grenfell Tower fire that will examine whether the government and the Royal Borough of Kensington and Chelsea failed in their duties to protect life and provide safe housing. The dramatic intervention by the independent Equality and Human Rights Commission, which has the potential to draw damning conclusions about the role of the state, could foreshadow the official inquiry, ordered by Theresa May and chaired by retired judge Sir Martin Moore-Bick, which has been criticised for excluding social housing policy from its remit. The commission’s recommendations are due to be published in April, considerably earlier than the official inquiry’s full findings. The commission’s chair, David Isaac, said the EHRC, whose application to become a core participant in the official inquiry was rejected, had decided to launch its own inquiry amid concerns that key questions – including the extent to which the state has “a duty to protect its citizens”– were being neglected. While acknowledging that the move might be seen as “controversial” in some quarters, he defended the commission’s decision to become involved. The cover-ups, the corruption, the lies and the deceit must be uncovered. If on Human Rights Day the Foreign and Commonwealth Office can blatantly claim that everyone is entitled to have their Human Rights protected, as per your other post today, this report will be vilified. The Govt will claim in their Report that “everything complied with current fire and safety regulations”. As to where the” missing millions” went is a different question. Perhaps some of it has been syphoned off to pay for the Grenfell Enquiry report itself! This skinflint Govt never spends any of its “own” money, ignoring the inconvenient fact that it is public money paid by us clowns that actually pay our taxes! Not so Mike the Tories as usual have been lying about this. Trouble is they have no idea as to the difference between a lie and the truth. But the (s)torys seem to have adequately briefed the DWP as to what broadly constitutes a lie when told by a benefit claimant – who might then be sanctioned of all benefit income for up to three years.